Most of us may have those Monday morning blues every now and then, but with working long hours becoming the norm and social media and technology seeping into every facet of our lives, it’s no wonder stress is on the increase. Gone are the days of clocking in and out, 9-5. These days getting in early, staying late, working from home and working at weekends are all the norm, especially now the world is even more connected than it ever has been. This of course means that it’s incredibly hard to switch off when you do eventually get home and take a break from work. We will take a look at the two biggest stresses that people have to deal with on a daily basis. Many jobs require you to stay longer if required, and most of the time now, it is required (I remember working till 9-10pm most nights in a previous job) and then back in work normal time the next day. Working longer hours can interfere with the time it takes to unwind after work and affect how well you sleep at night, and in some cases insomnia. With companies making cuts left, right and centre in resources to save money, it usually means that the employees get more responsibility and tasks to complete without any extra time given to them. This can lead to our first point, increased hours, decreased help available, and because of the current economy, and difficulty in finding jobs most employees will agree to it. As mentioned in the previous point, the poor economy has meant that with cuts in resources, job security is now the number one concern for most people in their day to day lives. Because people are scared of losing their jobs they will usually take on more than they can manage. So it’s worth taking a step back, and make sure you are not committing any of the above, or letting the above happen to anyone else. The internet and social media has grown hand in hand since its launch in the mid 90s, from Geocities (remember them?) to Twitter and Facebook as we know them today. Because technology has become part of our daily life, and so integrated with our working lives it can be incredibly hard to switch off from it all. You spend all day at work staring at a computer screen only to come home and spend a few hours on our iPad playing CandyCrush or looking for recipes on Pinterest (guilty!). There have actually been reports that show people who are not on social networks are less stressed, this may be in part, due to what we see on our Facebook and twitter feeds. Facebook ran a test earlier in 2014 where they experimented with what kind of news showed on feeds; half got more positive feeds, and the other half more negative, and they found that it directly impacted people’s moods, with more negative words showing in the statuses of the latter. 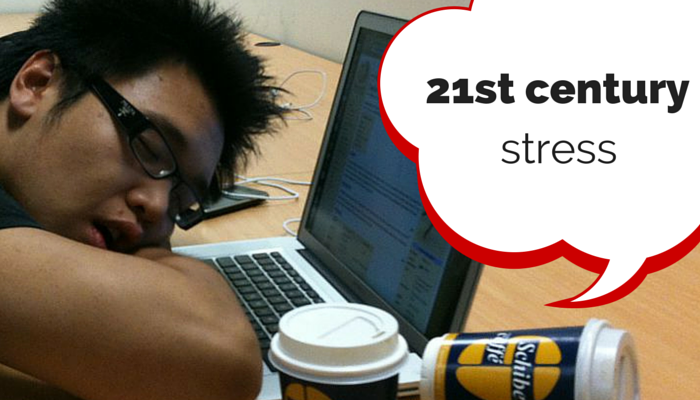 How do you reduce stress in the 21st century? You can hide certain pages or people from showing on your Facebook timeline, never again will you have to read another passive aggressive Facebook status. Communicate with your line manager if you are feeling overwhelmed with tasks. And again speak with your manager if you are feeling bullied or victimised in the work place, telling someone will lift a weight off your shoulders.